The crowned saint, wearing a robe, appears in the centre of the panel. She is seen through the window of a crenellated prison, which is cut through the thickness of the panel. 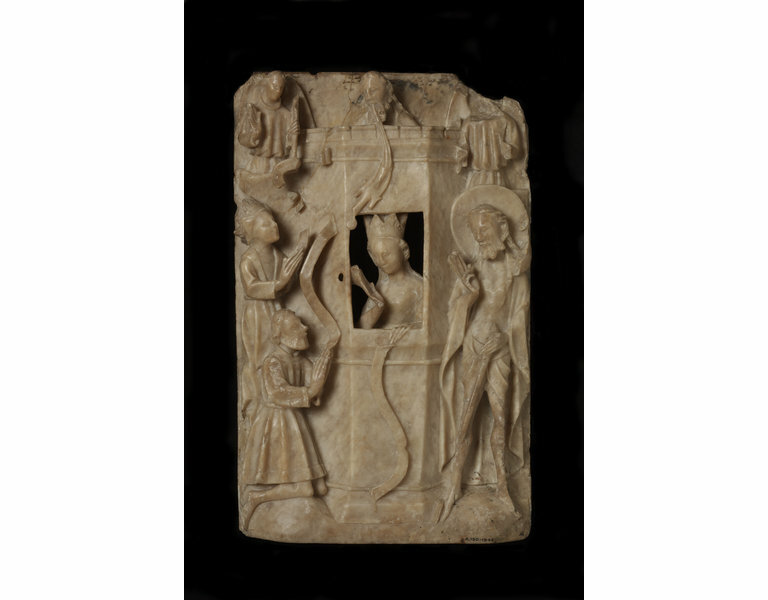 The saint looks to her right and gestures with her right hand to the figures of the Empress Faustina and Porphyry/Porphyrius (captain of the guard). A scroll curves down from her left hand, which rests on the sill of the prison window. God the Father is represented above the crenellation at the top of the tower. A dove issues from his mouth carrying a wafer in its beak. On the left of the panel, the Empress Faustina kneels in prayer, a scroll rising from her hands. The bearded Porphyry, wearing a short, belted gown, kneels in front of her in prayer, a scroll rising from his hands. On the right side of the panel stands the Risen Christ; he is haloed, bearded, and wears a torse, a loincloth and the shroud draped over his shoulders. He gives a blessing with his right hand, holding the cross-staff of the Resurrection in his left. An angel stands at the top left corner of the panel, his right hand raised, his left holding a taper. Another angel stands at the top right of the panel. A small hole has been bored through the panel at the left of the window. The taper held by the angel on the left side is broken as are the head and hands of the angel on the right side. The top right corner of the panel is missing. The scroll held by the empress has been broken off. Much of Christ's cross-staff is missing. The top left corner of the panel has been broken off and replaced. There is almost no trace of paint on the panel. The back of the panel bears three holes. The bottom has been cut away. There are two sorts of alabaster. Calcite alabaster is very hard and was used in ancient times. This object is made of gypsum alabaster which is a fine-grained, soft and smooth stone. Although at first glance it looks a little like marble, which it was intended to imitate, it was much easier to carve due to its softness, and alabaster objects were therefore significantly cheaper to produce. Marble does not originate in England, so it was imported if needed, whereas in the 15th century there were important alabaster quarries in Nottingham, York, Burton-on-Trent and London. England was a major centre for the production of objects such as this one. During period, they were exported in very large numbers to Europe where they survive, unlike many examples which remained in England and were destroyed or greatly damaged during the Reformation. Acquired by Dr W. L. Hildburgh in Paris. On loan to the Museum from Dr Hildburgh since 1928. Given by Dr Hildburgh in 1946. 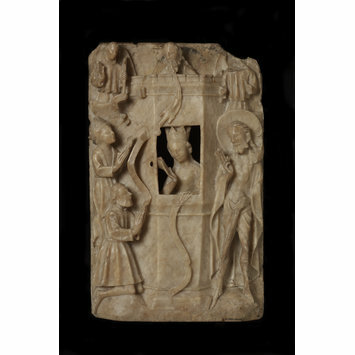 This panel originally formed part of an altarpiece depicting scenes from the life of St Catherine. St Catherine was a popular saint, whose story, recounted in great detail in the Golden Legend, was much represented in medieval art. 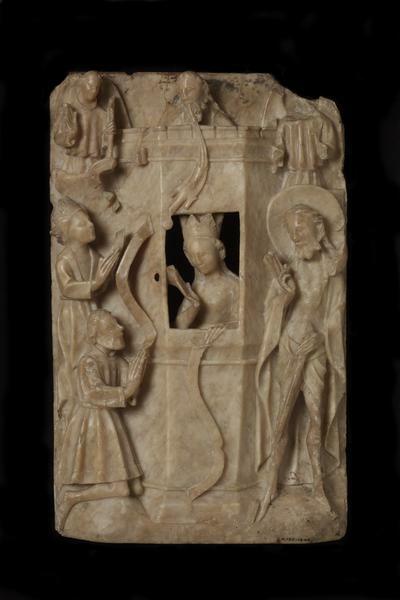 Alabaster altarpieces containing the same scene survive as far afield as Spain, Denmark, Venice and Vienna.